With no sense of irony whatsoever, the EU have been fining the UK for poor accounting over farm subsidies. 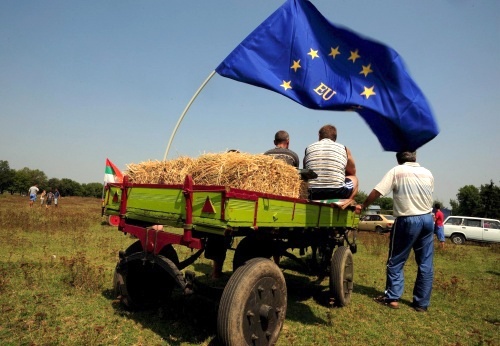 The Department for Environment, Food and Rural Affairs (DEFRA) exists solely to administer EU agricultural subsidies and implement EU directives as the British government long ago outsourced all agriculture policy to the EU. In England, the return of a fraction of our membership fees in the form of farm payments is administered by DEFRA who have failed to follow the lead set by the Scottish and Welsh governments whose systems are far superior and this has resulted in £642m of our own money having to be paid back to the EU in the form of fines. The EU Court of Auditors inspects the EU's accounts every year and then makes a statement based on the level of fraud, corruption and incompetence contained therein. For the last 19 years the EU Court of Auditors have flagged up serious levels of fraud, corruption and incompetence in the EU's accounts despite already having a pretty generous threshold of allowing 2% of transactions to be unacceptable. The EU fails to keep losses caused by fraud, corruption and incompetence below £2 for every £100 being spent. If the EU was a company, those in charge would be banned from being directors and would probably have gone to prison.